Readers to Eaters, 9780983661597, 32pp. "Sohn maash" is the flavors in our fingertips. It is the love and cooking talent that Korean mothers and grandmothers mix into their handmade foods. For Chef Roy Choi, food means love. It also means culture, not only of Korea where he was born, but the many cultures that make up the streets of Los Angeles, where he was raised. So remixing food from the streets, just like good music--and serving it up from a truck--is true to L.A. food culture. People smiled and talked as they waited in line. Won't you join him as he makes good food smiles? 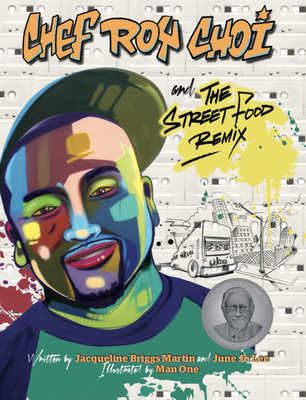 Jacqueline Briggs Martin, author of the Caldecott Medal winner, Snowflake Bentley as well as Farmer Will Allen and the Growing Table, and Alice Waters and the Trip to Delicious continues her Food Heroes series with Chef Roy Choi on people who change what and how we eat. Together with food ethnographer June Jo Lee and internationally renowned graffiti artist Man One, they bring an exuberant celebration of street food and street art. Jacqueline Briggs Martin is the author of many award winning children's books, including Snowflake Bentley, winner of the Caldecott Medal. Farmer Will Allen and the Growing Table, which was named an ALA Notable Children's Book and a "Best Nonfiction Books" by School Library Journal, was the first of her Food Hero series on people who changed what and how we eat. Alice Waters and the Trip to Delicious, the second book in the series, received a starred review from School Library Journal and was named a "CCBC Choices by Cooperative Children's Book Center. She enjoyed home cooking while growing up at her family farm in Maine, but also liked sampling from the Korean taco truck, ramen and congee at Roy Choi's restaurants while doing research for the book. She lives in Mt. Vernon, Iowa, and tries to eat kimchi everyday. Learn more about her at jacquelinebriggsmartin.com. June Jo Lee is a food ethnographer, spending her days visiting kitchens, dining rooms, and markets to understand how America eats. She's a national speaker on food trends and consults with organizations from university campus dining to Google Food and has been featured in the New York Times. She is also co-founder of READERS to EATERS, publishing books to promote food literacy. Like Roy Choi, she was born in Seoul, South Korea, and moved to the U.S., where she grew up eating her mom's kimchi. She now lives near Seattle, Washington. This is her first book. Learn more about her at foodethnographer.com. Man One has been a pioneer in the Graffiti Art movement in Los Angeles since the 1980s. His work has been exhibited at the Museum of Contemporary Art, Los Angeles, The Getty, and Parco Museum in Tokyo, Japan, and others. His artwork has been shown in galleries around the world including Australia, Germany, Mexico and New Zealand. He has painted live on stage at some of the largest U.S. music concerts and festivals including tours for MTV with The Black Eyed Peas. He is the recipient of the Speaker and Specialist Grant by the U.S. State Department to work with children in Panama to build self-esteem through art. In 2002, he founded Crewest Gallery, the premiere street art gallery in L.A. to give graffiti artists a professional venue to showcase their work. In 2014, he relaunched Crewest as a lifestyle media company focused on creativity, art and design. A proud Chicano artist, he is a first generation American whose parents immigrated from Mexico to Los Angeles in the late 1960's. He ate his family's delicious Mexican recipes at home growing up, but Bob's Big Boy was his favorite spot to eat out. This is his first children's book. Learn about Man One and Crewest at manone.com and crewest.com. Jacqueline Briggs Martin is the author of many award winning children's books, including Snowflake Bentley, winner of the Caldecott Medal. Farmer Will Allen and the Growing Table, which was named an ALA Notable Children's Book and a "Best Nonfiction Books" by School Library Journal, was the first of her Food Hero series on people who changed what and how we eat. Alice Waters and the Trip to Delicious, the second book in the series, received a starred review from School Library Journal and was named a "CCBC Choices by Cooperative Children's Book Center. She enjoyed home cooking while growing up at her family farm in Maine, but also liked sampling from the Korean taco truck, ramen and congee at Roy Choi's restaurants while doing research for the book. She lives in Mt. Vernon, Iowa, and tries to eat kimchi everyday. Learn more about her at jacquelinebriggsmartin.com. June Jo Lee is a food ethnographer, spending her days visiting kitchens, dining rooms, and markets to understand how America eats. She's a national speaker on food trends and consults with organizations from university campus dining to Google Food and has been featured in the New York Times. She is also co-founder of READERS to EATERS, publishing books to promote food literacy. Like Roy Choi, she was born in Seoul, South Korea, and moved to the U.S., where she grew up eating her mom's kimchi. She now lives near Seattle, Washington. This is her first book. Learn more about her at foodethnographer.com. Man One has been a pioneer in the Graffiti Art movement in Los Angeles since the 1980s. His work has been exhibited at the Museum of Contemporary Art, Los Angeles, The Getty, and Parco Museum in Tokyo, Japan, and others. His artwork has been shown in galleries around the world including Australia, Germany, Mexico and New Zealand. He has painted live on stage at some of the largest U.S. music concerts and festivals including tours for MTV with The Black Eyed Peas. He is the recipient of the Speaker and Specialist Grant by the U.S. State Department to work with children in Panama to build self-esteem through art. In 2002, he founded Crewest Gallery, the premiere street art gallery in L.A. to give graffiti artists a professional venue to showcase their work. In 2014, he relaunched Crewest as a lifestyle media company focused on creativity, art and design. A proud Chicano artist, he is a first generation American whose parents immigrated from Mexico to Los Angeles in the late 1960's. He ate his family's delicious Mexican recipes at home growing up, but Bob's Big Boy was his favorite spot to eat out. This is his first children's book. Learn about Man One and Crewest at manone.com and crewest.com.